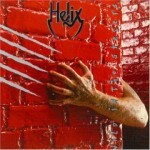 An integral part of Canuck bar band culture – emphasis on the “cult” part, as in favourite – if there was ever a band that deserved ten times the commercial success they received, it’s Helix. Canada’s long suffering answer to AC/DC has been slugging out since the ‘70s with varying line-ups and musical quality, with Wild In The Streets considered by many fans to be their best record. I remember playing the hell out of this thing, the attraction being that Helix was grittier than the mind-boggling amount of fluff making the rounds at the time and a satisfying break from the daily doses of thrash without feeling like I was wimping out. Listening to it now, nothing’s changed. I can still get my rocks off with the title track, while I’ve gained added appreciation for ‘High Voltage Kicks’ (frickin’ brilliant), ‘Give ‘Em Hell’, ‘Kiss It Goodbye’ and ‘Shot Full Of Love’. Even their cover of Nazareth’s ‘Dream On’ smokes in its own way (there, I said it; sue me). The only complaint to be made is sticking the bobblehead plod of ‘Never Gonna Stop The Rock’ as track #2, thus destroying the momentum created by ‘Wild In The Streets’. The same thing I bitched about 20+ years ago. And while I remember frontman Brian Vollmer storming through this with That Voice (I don’t know if the title belongs to anyone right now, but they should give it back) the axework of guitarists Brent Doerner and Paul Hackman was brutally underrated. They were one of those ultimate guitar duos, up there with Tipton and Downing as far as being able to play off one another to brilliant effect. Wild In The Streets is testament to that brilliance, and it has nothing to do with too many beers consumed or rose coloured glasses on my part. The crowning glory of the album at this point in time, however, is ‘She’s Too Tough’, a song penned by Def Leppard’s Joe Elliot but recorded by the Leps several years after Wild In The Streets was released. The Def Leppard version appeared on their b-side compilation Retro-Active from 1992, with a footnote stating the history of the song and commentiing on Phil Collen’s “far superior” guitar work. Nothing against Collen, but Helix’s version is the freight train against the Leps’ broken down VW Bug parked on the tracks. Fave tracks: ‘Wild In The Streets’, ‘High Voltage’ Kicks’, ‘She’s Too Tough’, ‘Dream On’, ‘Kiss It Goodbye’. Check out the whole album, streaming here. Cool site Carl,this album is like you said there best,What ya bringing to the party is another great track,got this album on my ipod as well,too bad like you said that this album got left behind while other fluff was selling,also the fact that they never really got on a huge tour as well at that time did not help the cause,if they would have say got that coveted opener slot with say Aerosmith or Motley i think things would have been way different…..